Wow, so much has happened in the past three days that it's going to be hard to recount all of the events of my trip to Karugutu. It would probably be enough material for a novel. The paperback edition can be purchased for 9.95 at any reputable book store. So I will start from the beginning. We wanted to get this day started early, because we had to travel to Karugutu Town from Nyahuka which is about a 2 and a half hour drive. Bombogada said that he would meet me at 6:30am at Michaels to help me load the truck. Well, 6:30 rolled around and there was Michael and I…no Bombo to be found. So we started to load the truck, etc. etc. and then I happened to notice that the front lights were on. Michaels truck has the really fun quality of sometimes turning the headlights even when the switch is off. So, you guessed it, the battery was completely dead. On top of that, it hadn't been secured in well by the mechanic who replaced it and one of the belts of the engine had worn a hole through the side (which is not good). All of the acid from one of the cells had splashed over the engine and basically the battery was running one cell short. We tried for 30 min or so to jump the truck from another truck…but to no avail. As a last resort we gave it the ol' push start down a hill and sure enough, when he popped the clutch the engine cranked right up (thankfully the hill was nearby. 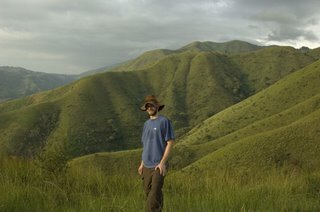 All of this took approximately 2 hours, so we ended up leaving at 9am…not exactly the plan, but hey, it's Uganda. The road to Karugutu was absolutely gorgeous. A significant portion of it is in the Semiliki National Forest, so it is not developed. We even saw baboons on the side of the road, which of course ran into the bush before I got the camera out. Once we arrived in Karugutu we ate a brief lunch that consisted of rice and a small portion of meat. Cost: $1. After lunch we loaded up our gear and got set to hike. Being the avid hiker that I am I brought along my pack since it would make it easier to load up the pipe and tools. Since I had a large pack and because I foolishly had to be the tough guy who can carry a heavy pack I gave myself about a 40 or 50lb load. Of course I would disregard that 1) That is a heavy load, 2) That I am from FLORIDA (max elevation, like 300 ft), 3) That the height of the BOTTOM of the mountain is at an altitude of about 2500ft, 4) That the TOP of the mountain is 5000+ft. This is a long way of saying that I barely made it to the reservoir tank with that thing on my back. (The reservoir tank is hardly even on the mountain). So yeah, in front of all of the Ugandans, I was humbled by the heavy pack. Fortunately, Michael carried it the rest of the way, and I carried his load. I think it evened out here, because Michael went back home that afternoon, and I would be hiking that same path for the next three days!!! YIKES. So we get up to the top of the mountain. It is absolutely beautiful. Amazing. Gorgeous. PAINFUL!! But we made it. So we immediately begin evaluating the work to do and not 30 minutes into our arrival what did appear? Not Santa Clause. It was a heavy down poor. So Michael and I and about 8 Ugandans huddled under a green tarp for about 30 minutes while the heavens let fly. Of course the temperature on the mountain dropped about 30 deg after the rain, so we were tired, wet and cold and hadn't really done anything. We did some prep work at the intake and tried to identify the blockage at the sedimentation basin. By this time it was 4:30pm and the sun would be setting soon. So we loaded up our gear…stashed a few things in the bushes and headed back down the mountain. We dropped equipment off at the storage unit that we were renting and went to get some yummy dinner. What did I eat you ask? How about a bowl of rice with a small portion of meat (yeah the menu was still the same for dinner as lunch). All for $1. Incredible. Of course then we had to find lodging, which at that point was only semi-booked (not yet paid for). I was pleasantly surprised to find that the lodging was clean and had mosquito nets, even if my room was only 7' X 9'. Time 8:30pm. Where am I? In bed. The night was a pretty fitful one as far as sleeping goes. I think at first it was the heat combined with the aching legs. Of course, I can't write of my accounts of Karugutu without including this little story. So one would think that with all of the physical exertion that I would be on the partially dehydrated side of things and not have to wake up in the middle of the night to go to the restroom. One would think. But of course I wake up at 3:30am in need of the cho (outhouse in lubwise). Well normally if you have to pee in the middle of the night you use a bucket, but since I had not been blessed to discover the bucket used for that purpose in the hotel (it was hiding under the bed), I found myself in quite a quandary. I didn't want to be attacked by malaria carrying mosquitoes on the way to the cho, but I didn't want to don the full mosquito protection garb or have to get my torch (that's what they call a flashlight) and unlock and relock the door…as you can see, the cho in the middle of the night is quite a chore. Instead I opted for a far more superior method. I like to call it, the fluid exchange. You see, what I didn't mention to you is that I had 4, one-half liter bottles of water for consumption the next day (Since I have not been exposed to the germs in their unfiltered tap water I have to drink bottled or filtered water unless I want to spend some significant time in the cho…if you catch my drift). I also had a full nalgene. So my wonderfully concocted plan was to drink a half liter from my nalgene…pour one of the bottles into the nalgene leaving me with an empty bottle. Now I'll leave the rest to your imagination, but let me just say that I praise God that my bladder was only holding exactly one-half liter that night…could have been ugly. I awake at 7am to start the morning, somewhat sore - fearing the climb ahead and wondering if my body can handle it. We go to town to purchase supplies and get some breakfast. Breakfast consisted of tea, chipaties (flour tortillas) and one hard boiled egg. Of course this process was not anything like drive through McDonalds, so we were ready for hiking around 8:30. Fortunately for us, it was blazing hot at 8:30. We immediately regretted that decision. We began our ascent of the mountain, this time my load was significantly lighter. We arrived at the work site two and a half hours later (yes, the porters were already there having hiked faster than us even though they had 50lb loads). They all had big smiles of course when we finally arrived. We got a lot of work done the second day – the laborers dug the trench, we worked on the intake and unclogging the sedimentation basin. In the late afternoon we attempted to create a temporary connection to the water source, bypassing the masonry work that we had done at the inlet. The water made it down to the sedimentation basin, but there wasn't enough pressure through the temporary connection to actually flow water through the basin. Of course, we made that last connection within the last 30min that we possibly could have stayed because it was getting dark and we couldn't hike down after dark. We were really disappointed when we got down the mountain and found out, no it in fact was not flowing down. (We had hoped that the reason that it was not flowing in the line was that it was filling the line and working out the air pockets and that it would begin to flow by time we had reached the bottom). The workers cooked lunch for the work crew – it was (wait for it) a bowl of rice with a small portion of meat. Something new. However, they added some onions and seasoned it very nicely. We ate dinner at the same restaurant in town and sure enough – a delicious bowl of rice with a small portion of meat. When we finally got back to the hotel I decided that it was imperative that I bathe. Most of the bathing is done with a wash basin and the hotel had special rooms just for that. They looked exactly like a cho, just no hole. However, this was a really amusing time, because there are no lights in these rooms, so you have to leave the door open. Now modesty isn't really high on the list in Africa (well I can discuss this further in a moment), but this is no big deal for the Africans to leave the door open. If fact, it hardly matters, because it is so dark in the room and since the Africans have very dark skin you really can't see anything if you walk by. However, if you happen to be a white, Majungu in one of these rooms you have the amazing quality of practically glowing in the dark. So if you happen to look in to the room, yes you can see a lot. A whole lot. Fortunately for them, they seemed cool with the whole idea and I didn't mind an opportunity to show off the bod…so I went with it (hahaha, actually I was more concerned with how to bathe yourself with only a wash basin and no running water, because I'm pretty sure it was the first time I had to do so). What time was I in bed? Oh yeah, 8:30pm. Oh yes, there was one more day in the mix for me. 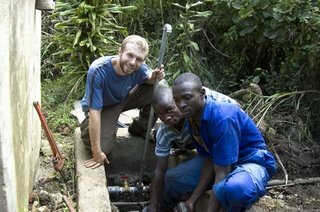 One more time up the mountain, one more day trying to get the temporary water connection to flow (we won't return to finish the project until next Monday, please begin praying for the legs now!!!). However, this time we had wizened up and we began hiking at 6:30am. Oh yeah, all the difference in the world. Once we arrived at the site, Bambo began work on the tap stand for the cattle trough (we are making the cattle trough so the locals on top of the mountain will not water them at the source – bad news bears for the town). Kizza and the masons finished up the masonry on the intake. And I had the lovely job of making the water flow in the temporary connection. To do this one of the laborers and I had to lower one of the high points in the trench that was close to the intake. In addition I rigged up a plastic dam to raise the water level high enough to get a reasonable pressure, but it also had to simultaneously keep the water off of the newly finished masonry. All in all I raised it a few inches above the rock and mud dam that we had already created and that was enough to make some water flow (approx 1-2 L/s). Not full flow, but something for the town until the project was finished (word on the street was that they were getting a little restless). We finished up about twelve thirty and hiked back down the mountain for lunch. And what did we have for lunch? An amazing chicken lunch with rice and matoke. We had pre-ordered this so that it wouldn't have been a bowl of rice with a small portion of meat. However, eating chicken means that there was a gizzard. In addition, since I was the only missionary there with the Ugandans, I was in charge of the money. Since I was paying for the meal…guess who plate the gizzard fell on. Oh yes. Don't you just love cultures? God really blessed us that day, because the moment we stepped inside for lunch a violent hail storm unloaded from the sky – it would have been a nightmare to have been on the mountain during that. However, please pray that it did not destroy any of the drying masonry or the temporary water connection. Right after lunch we were outside waiting for public transportation and low and behold, who goes flying by on the main road? White people. More than that, white people with a WHM sticker in the side of the car. It was Kevin and JD Bartkovich…the headmaster of Christ School and his wife returning from a few days in Kampala. So I start hootin and hollin for them…but of course the car was too loud and we were by the restaurant tucked away from site…so they couldn't hear me. Fortunately I had my trusty, been through the wash cell phone with me, so I whipped it out and got a hold of them before they got out of town. What a blessing. So that was my trip to Karugutu. God was really faithful to me in answering prayer to give me strength to get up the mountain. It was almost a constant simple prayer of "Lord, give me strength" or singing songs in my head. There were a lot of struggles this week, more than just the physical difficulty. One of the biggest being the language barrier. 80-90% of the conversations where held in Lubwise or another mountain language (Lukongo?). English was only used in addressing me and none of the laborers could speak it. Another huge difficulty was that Ugandans have a very hierarchal society and since I was responsible for the project it put me on the top of the food chain. So the balance between how to be the boss, yet to not "lord it over them," but instead to be a "servant" leader while being sensitive to the culture was a difficult one to find while on top of that trying to share Christ with people who don't speak your language. Needless to say, I hope that God worked in the lives of those who worked with me in spite of me and my limitations and also my sinfulness. Thanks for the great editorial of your past three days. I'm envious of the fluid rebalancing trick. Mazz said I could not try it here. I miss you alot but your writing helps us keep connected. awesome josh, rachel here...can't wait to bike down Btogo Road with you...you been down there yet?? Great entry, Josh. Looking forward to meeting you soon! You are such an inspiration! I will keep praying that God will give you strength and encouragement!